Geographic Information Systems (GIS) is a technology that is set apart from other information technologies by the need to identify 'where' or location. Our members have diverse interests, but share similar geospatial challenges. ILGISA brings together the GIS community of Illinois through an annual conference, regional meetings, workshops, webinars, GeoTalk blog and the GIS Jobs Center. ILGISA serves GIS professionals from the public and private sector. We offer technical training and education opportunities, awards for service, an annual student scholarship and map competition. CHECK OUT ILGISA'S NEW BLOG "GEOTALK"
DO YOU HAVE A GIS RELATED QUESTION? Geographic Information Systems (GIS) is a technology that is set apart from other information technologies by the need to identify 'where' or location. Our members have diverse interests, but share similar geospatial challenges. 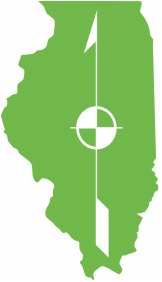 ILGISA brings together the GIS community of the State of Illinois through an annual conference, regional meetings and the publication of Illinois GIS Notes. We offer technical training and education opportunities, awards for service, an annual student scholarship and map competition.